Among nautical myths and legends, few are as famous as the Flying Dutchman. Many have claimed to see the ghostly vessel of Captain Hendrick van der Decken (the Dutchman) since it sank in 1641. It is because of his brash attitude in the face of God’s stormy wrath that Captain van der Decken and his crew are cursed to sail the high seas until doomsday. Captain van der Decken had made the perilous journey from Holland to the Far East Indies in order to purchase lucrative goods like spices, silks, and dyes. There had been close calls of course but they eventually arrived. After purchasing as much as the hull could hold and having made the necessary repairs to the ship, captain van der Decken set out for Amsterdam. As his ship rounded the coast of Africa, captain van der Decken thought of how convenient it would be if his employers, the Dutch East India Company, made a settlement near the Cape of Good Hope in South Africa to serve as a respite from the turbulent waters. The Captain was deep in thought as his man-of-war ship began to round the Cape. Suddenly, a terrible gale sprung up, threatening to capsize the ship and drown all aboard. The sailors urged their captain to turn around but Captain van der Decken refused. Some say he was mad, others say he was drunk but for whatever reason, the Captain ordered his crew to press on. He lit his pipe and smoked as huge waves crashed against the ship. The winds tore at the sails and water spilled down into the hull. Yet the Captain “held his course, challenging the wrath of God Almighty by swearing a blasphemous oath” (Occultopedia, 2016). Pushed to their limit, the crew mutinied. Without hesitation, Captain van der Decken killed the rebel leader and threw his body into the turning seas. The moment the rebel’s body hit the water, the vessel spoke to the Captain “asking him if he did not mean to go into the bay that night. Van der Decken replied: ‘May I be eternally damned if I do, though I should beat about here till the day of judgment’” (Wagner quoted in Music with Ease, 2005). At that, the voice spoke again saying, “As a result of your actions you are condemned to sail the oceans for eternity with a ghostly crew of dead men bringing death to all who sight your spectral ship and to never make port or know a moment’s peace. Furthermore, gall shall be your drink and red hot iron your meat.” At this, Captain van der Decken did not quaver for an instant. Instead he merely cried “Amen to that!” (Occultopedia, 2016). Since then, Captain van der Decken has been given the moniker the Flying Dutchman, sailing his ghost ship the world over. Sailors claim the Dutchmen has led ships astray, causing them to crash on hidden rocks or reefs. They say that if you look into a fierce storm brewing off the Cape of Good Hope, you will see the Captain and his skeletal crew. But beware, legend has it that whoever catches sight of the Dutchman will most certainly die a gruesome death. The legend of the Flying Dutchman first gained widespread popularity with Wagner’s 1843 opera, The Flying Dutchman. Yet, the reason the legend has endured so long and has been the subject of so many retellings (seen in or inspiring not only Wagner’s opera but also Coleridge’s The Rime of the Ancient Mariner, Pirates of the Caribbean, a SpongeBob Square Pants character, a Scooby-Doo episode, and more) is because there have been so many supposed sightings of the ghost ship. Today, scientists insist that the Dutchman’s ship is nothing more than a mirage, a refraction of light off of the ocean waters. Please email April at [email protected] for more on your inquiry. I am the editor-in-chief of the multicreative, themebased and bimonthly The Creativity Webzine. We now have 1500 weekly readers to our credit. 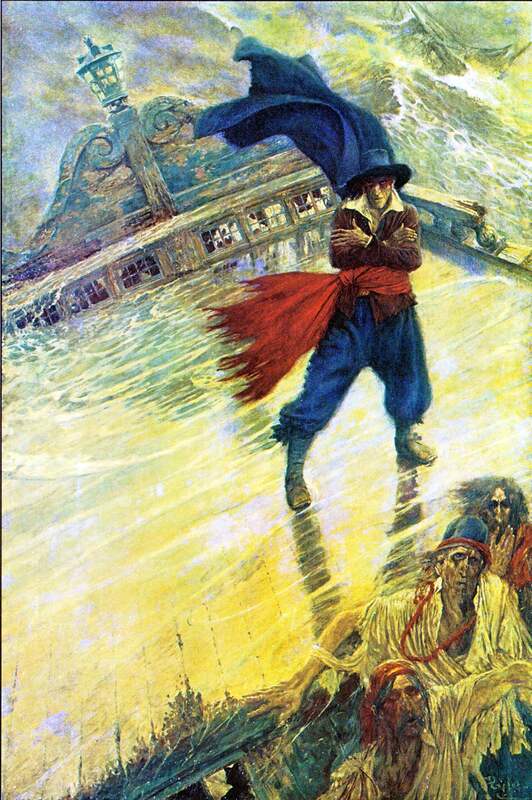 This week, we are going online with "The Saltwater Buccaneer", an issue about discoverers and pirates. I have looking to no avail for a perfect article about The Flying Dutchman. We, me and my staff, are cordially posing the inquiry if we might be allowed to republish this article. It would be as profitable to Kerry Sullivan as to your journal, as we would be doing good PR for our 6000 monthly readers for both, maybe even launching a collaboration of sorts between our publications and gathering authors for both journals.